Papua New Guinea hosted the XII Oceania Swimming Championships over a six-day programme. 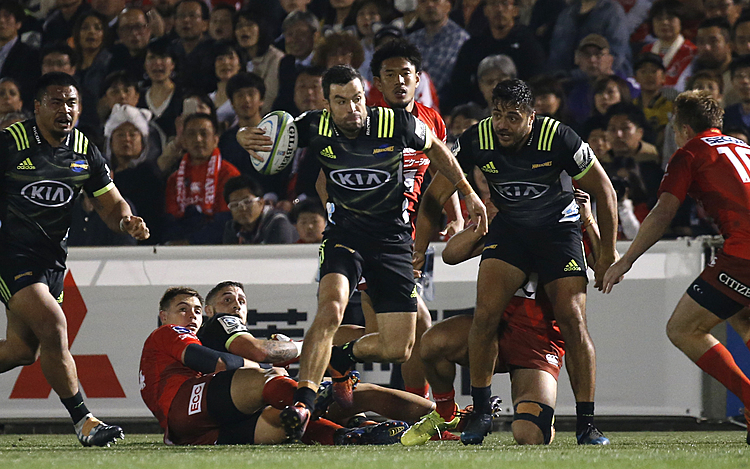 Samoa fielded a small yet strong team of two females and four males to put their training to the test and succeeded brilliantly. The first event was the Open Water 5km race where lone Samoan swimmer, Sitivi Sooaemalelagi, came in a close 4th place behind distance swimmers from Australia and New Zealand. Sooaemalelagi clocked in on a 1 hour and 4 minute time, just missing the Pacific Games record of sub one hour. He was awarded the Island Gold for his outstanding effort. The pool events followed over the next four days, with the six Samoan swimmers ranking high in preliminaries and advancing to finals every night. Day 1 showcased the female talent of Lushavel Stickland and Jelani Freesir-Wetzell. Both advanced to the A Finals for the 100m backstroke with Stickland taking out the Oceania Silver medal for overall 2rd place and Freesir-Wetzell improving her final ranking to 6th overall, breaking an Age National Record for 15 year olds and achieving the Island Silver Medal. Other highlights of day one was Brandon Schuster in the 200m freestyle, breaking the Men’s Open National record and earning an Island Gold Medal for 4th place overall. The team worked tirelessly on the first day to ensure qualification for the first mixed relay on the schedule. 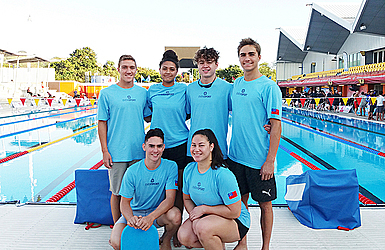 Thomas Morriss joined in with Vernon Wetzell and the two female swimmers to swim the preliminary 4x50m freestyle mixed relay breaking the National record at one minute and forty-five seconds. For the finals, Schuster joined force with Wetzell and the team took out the National Record by a further two seconds but came in .5 seconds behind rivalry Team Fiji. Day two at the pool competition saw National Record holder and 2016 Medalist, Lushavel Stickland, on the podium once again for the 50m backstroke in overall 2nd place and taking the Oceania Silver Medal. Freesir-Wetzell earned the Island Gold Medal in the same race for 4th overall. The men had equal success in Schuster winning an Oceania Silver medal in the 400m IM and breaking his own National record. Moving from podium to another race, both Stickland and Freesir-Wetzell were in the 100m freestyle B finals with Stickland pulling in second place and Freesir-Wetzell breaking another Age national record. The men’s 100m freestyle showcased Schuster in the A finals and Wetzell and Morriss in the B finals making personal best times for both Wetzell and Morriss. Day three, touted as the toughest day both physically and mentally, challenged all six swimmers in their chosen events. Wetzell took his choice event of 50m breaststroke into the B finals, broke the Open National record and achieved a personal best time. Schuster took out the Island Gold Medal for the 400m free and turned around to claim the Island Silver Medal in the 200m backstroke. Meanwhile, Sooaemalelagi proved himself in the 100m Butterfly B final coming in 4th and Morriss, in the same race, broke the Age National Record. Stickland, a sprinter by trade, came out with the Island Gold Medal in the middle distance event of 200m backstroke. The day was closed with the men’s 4 x100m freestyle A final closing in a tight race for 4th place against the PNG men’s team losing the touch by .35 of a second. The final day brought additional cheer and medals to the overall tally. Sooaemalelagi scored the Island Gold Medal in his trademark 200m Butterfly event, smashed his seed time by over 6 seconds and broke the National Record. In the 50m freestyle, Morriss broke the Age National record, Freesir-Wetzell broke the female Age National Record, and Stickland and Wetzell placed 2nd and 3rd respectively in the B finals. Schuster secured the Bronze Oceania medal in the men’s 200m IM moving the overall medal tally up to 12. The competition was completed with the men’s 4x 100m medley relay coming in on a 4:09.58 and breaking the National Record. It was an intense week of back-to-back races, but the strong six person team made an indelible impression on their competitors, the medal board and setting new records. All week the team learned to celebrate their successes and then set their bar higher each time they stepped on the blocks. A strong equation of 6 swimmers and 33 races, resulted in 30 finals, 12 medals won, 11 National Records broken and 13 personal best times - a significant step for Samoa Swimming for sure.